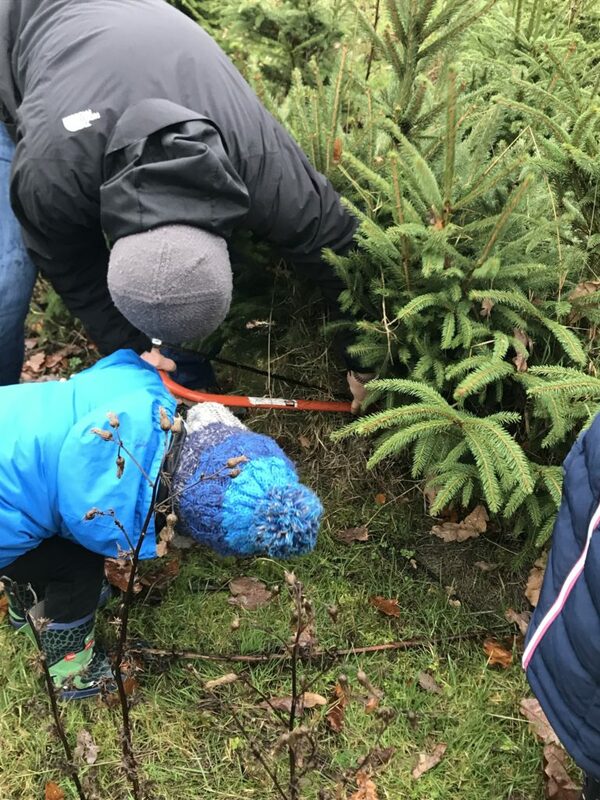 Our sister site North Leeds Mumbler recently visited Methley Christmas Tree Farm, found out more here. 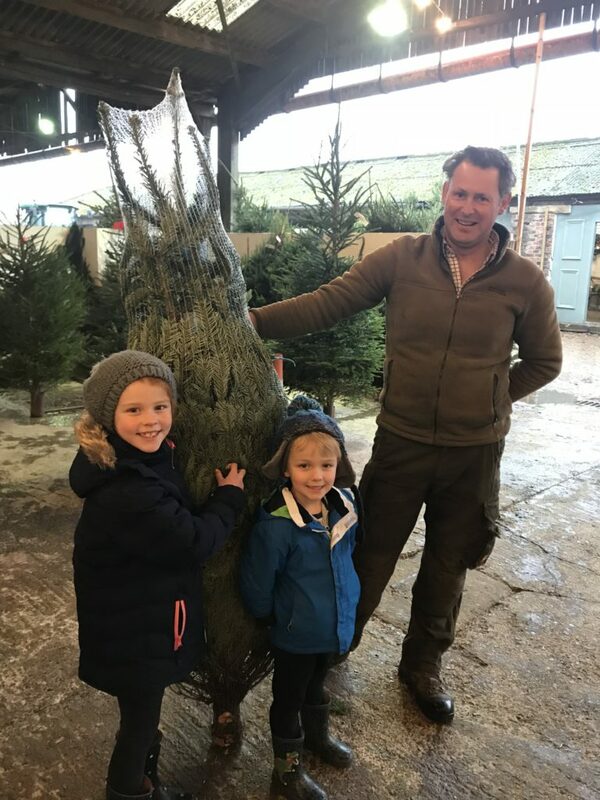 The Mini Mumblers had been asking about getting a real tree (how many of the magical Christmas stories have an artificial tree!) 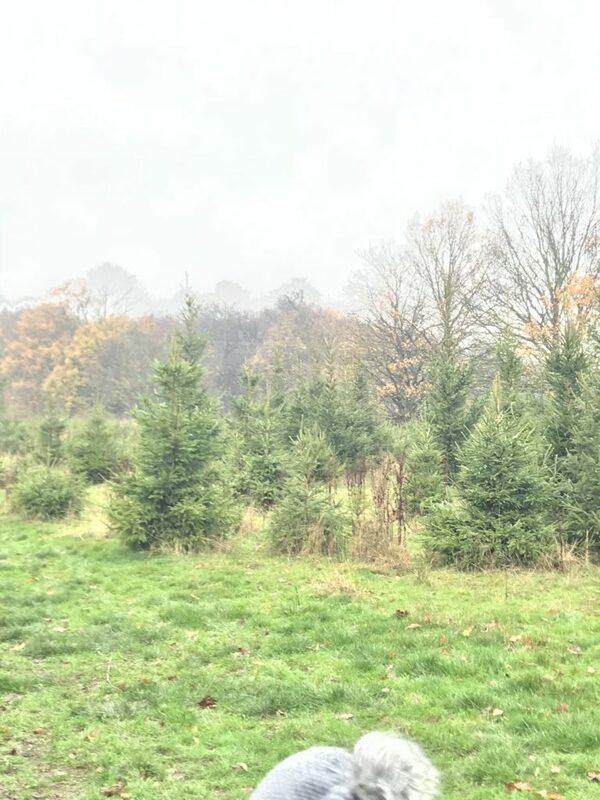 so when we were invited to go to Methley Estate Christmas Tree farm they were very excited! 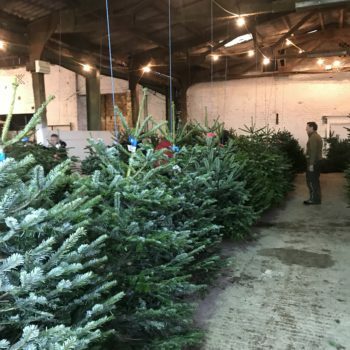 Methley offer a variety of real, estate grown Christmas Trees and not only can you pick a tree but you can even cut one down yourself if you wanted! The day we were going was very wet but this didn’t put any of us off, we were all excited to go and pick our tree. 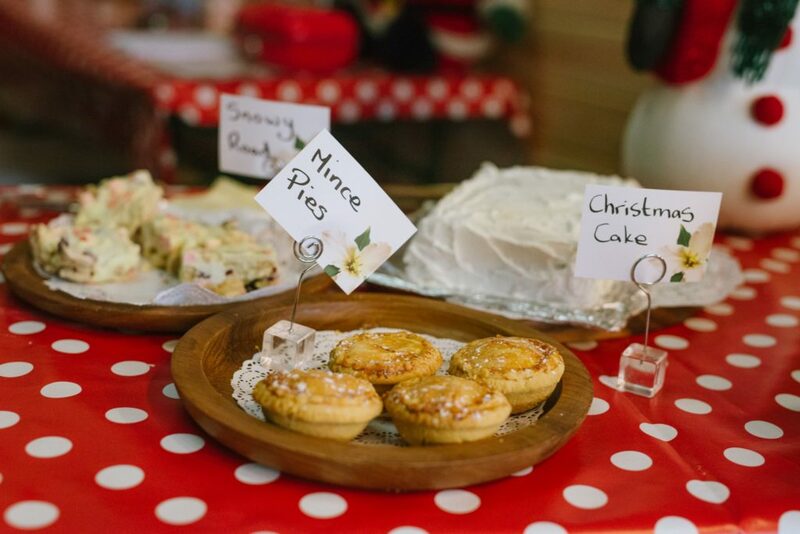 In the car on the way, there was much discussion about what type the Mini Mumblers were going to pick and then how they were going to decorate it when they got back – I have to say it took me back to my childhood and the excitement of Christmas. 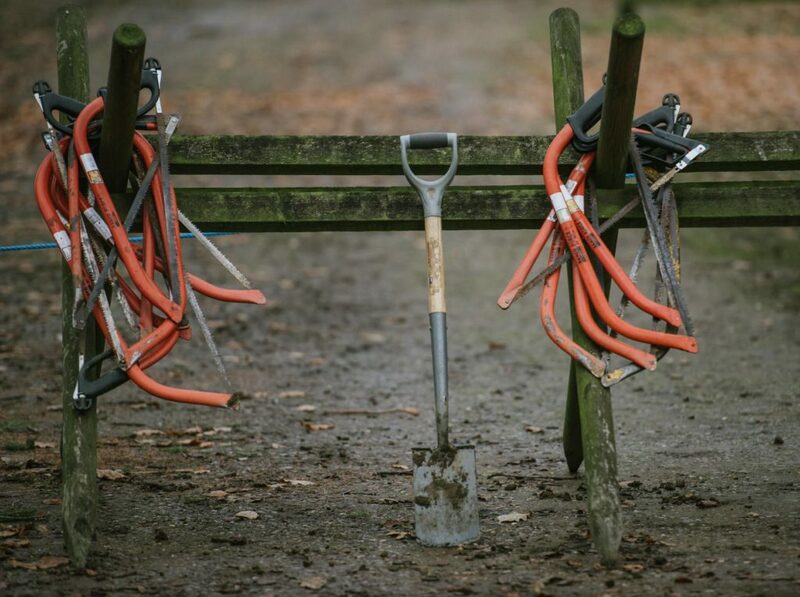 When we arrived at the Methley Estate (signposted just off the A639) there was plenty of parking space and it was the site of what is through the rest of the year a normal working farm. 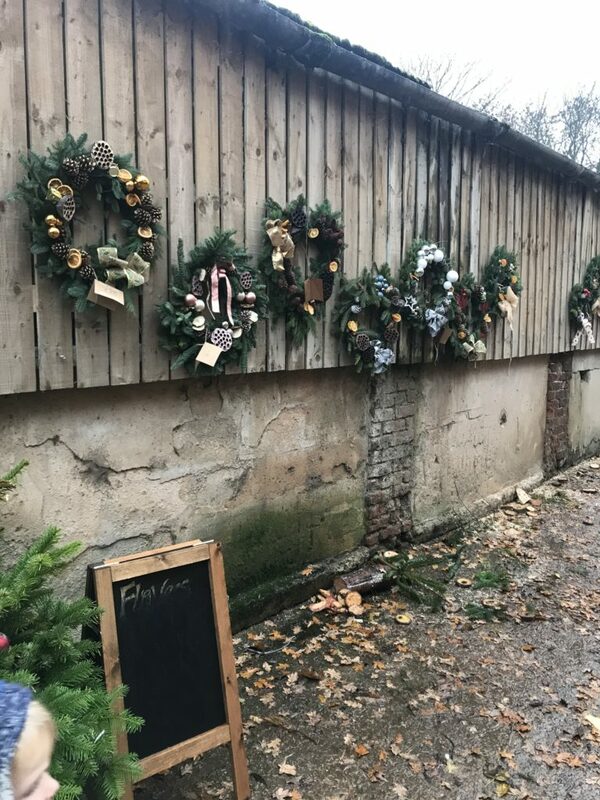 However, for the Christmas period a number of the outbuildings and sheds have been converted and house all of the trees and little shops. After parking up we went to explore and went into the main outbuilding where there were hundreds of trees all separated into different sizes and different types. 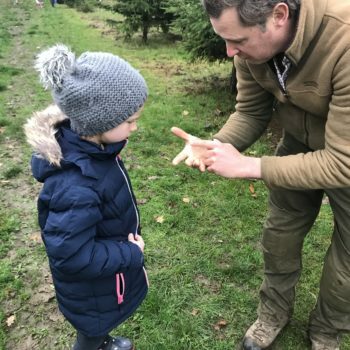 The team that worked there were really knowledgeable about the different types of trees (Will showed us round) and were able to give advice on which type of tree was best depending on what your requirements were. 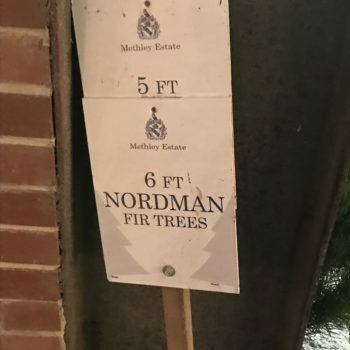 They sell Nordman Fir, Fraser Fir and Norway Spruce trees. 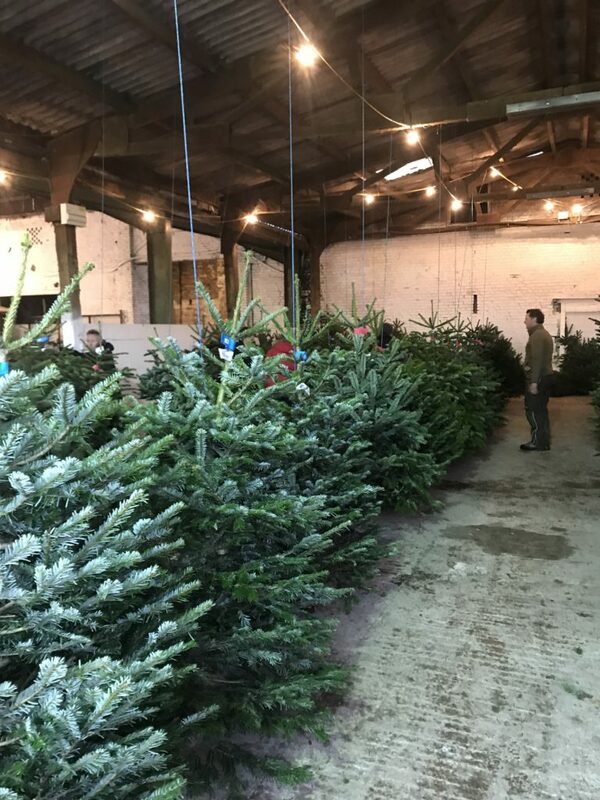 They were also really easy to get a proper look at as each of the trees were hung from the ceiling so were stood upright meaning you could see straight away if it was not only the right height but had the right spread of branches – unlike many other places where the trees are already parcelled up and you get a surprise when you get home. After we had taken a look inside we then went out into the field to pick a tree and cut it down ourselves. 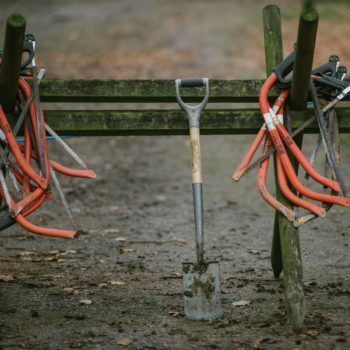 We were given a saw (there were lots to choose from and some of a size that were ideal for the Mini Mumblers) but there were also spades in case you wanted a tree with its roots that you could replant at home. 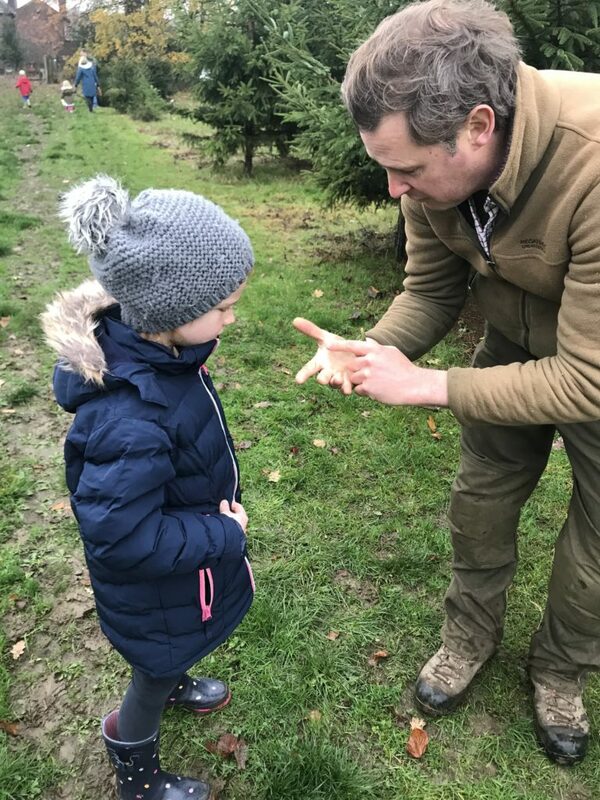 We then set about picking a tree and there were so many to pick from. 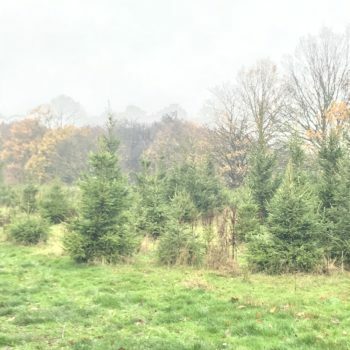 You could also see where younger trees were growing for future years – it normally takes 6 to 10 years for a tree to grow to the size most want. 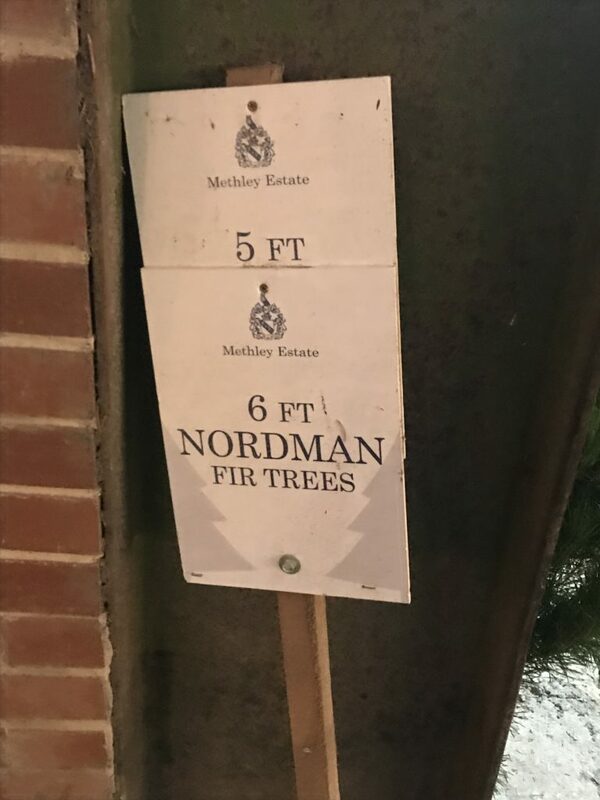 For every tree cut there is at least one more planted in its place which gave me confidence that the tree was coming from a sustainable source (and not taken from natural woodland). The Mini Mumblers picked a tree and we started to cut it down. It took no more than a few minutes and the Mini Mumblers were able to help with their saw. At the end of the field there was then someone to help put a wrap around it meaning it was easier to transport and would fit in the back of the car. Once brought home cut the bottom 1cm from the base of the trunk and keep the tree outdoors standing in a container of water sheltered from the wind and sun. This will help the tree retain its moisture until you’re ready to bring into the house for decorating. 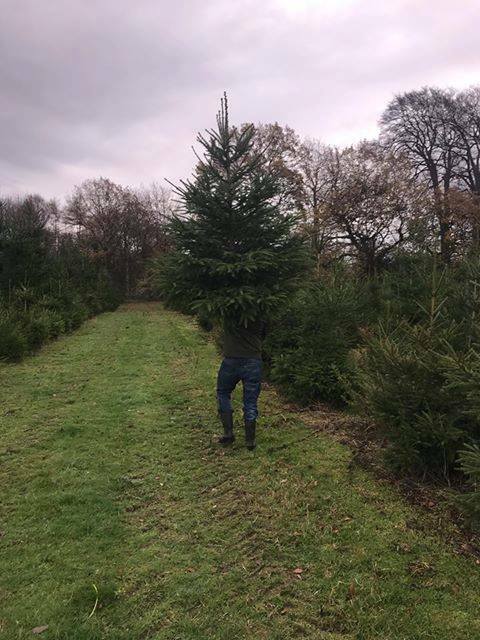 Before bringing the tree into your house and placing it in a stand, cut another 1cm off the base of the trunk which ensures that the tree stem is open and can take up water. 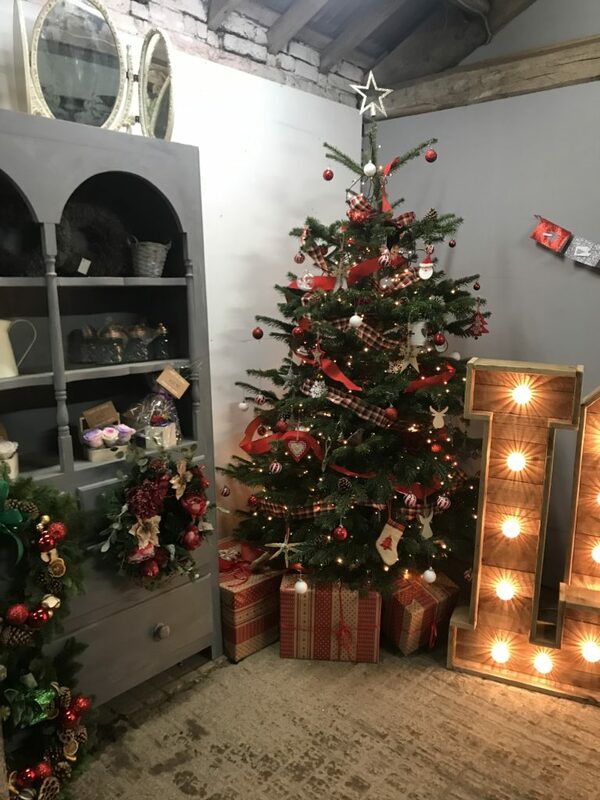 When in the house use a water holding stand filled with fresh water and check the level every day topping up as necessary – Christmas trees are very thirsty and can use up to 2 litres of water every day. 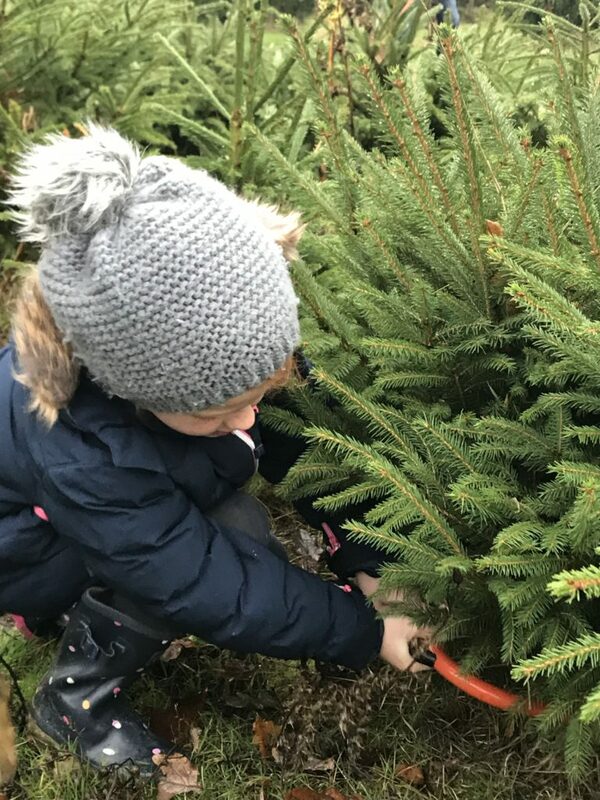 Having picked our tree we decided to go round the different shops and see what else there was. 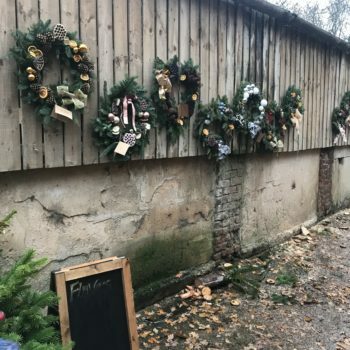 Firstly, we found a little shop run by Flowers & Events by Cathryn.selling lots of different types of Christmas tree decorations along with fresh mistletoe, handmade jewellery and a wide selection of wreaths. 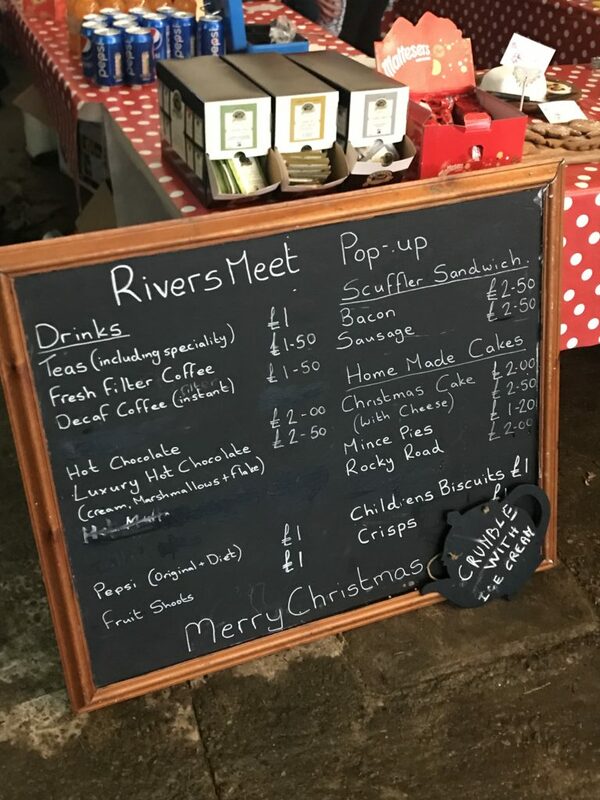 They were all really good and we came away with some more baubles and some mistletoe (if we kept it in water we were told it would keep for a few weeks until we then needed to put it out). 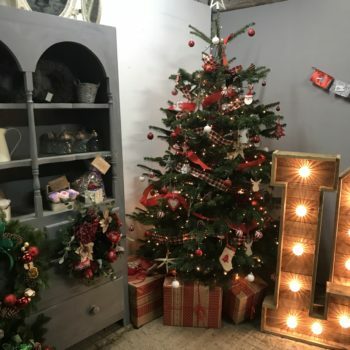 There was also another shop selling other Christmas accessories including bases to put your Christmas tree in. 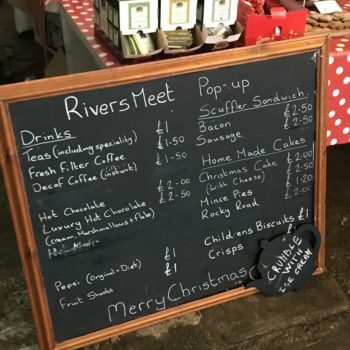 There was also a small pop-up café run by Rivers MEET selling a selection of hot festive drinks, cakes, mince pies, Christmas cake, children’s reindeer biscuits, along with sausage and bacon sandwiches. 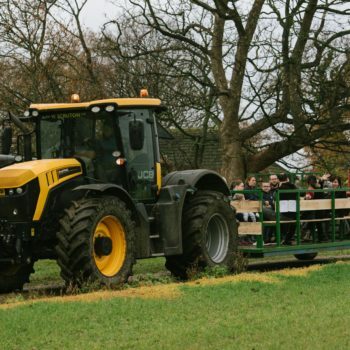 Finally, we also found a free tractor ride which took you around the estate for a donation to charity. The family on before us told us they had seen wild deer in the fields. We weren’t as lucky but the Mini Mumblers enjoyed it just the same. 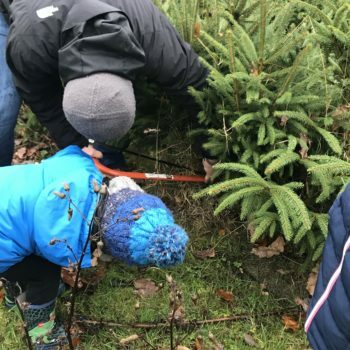 Overall we spent a good hour picking and cutting down our tree and it was a great experience to do as a family – one we will definitely be repeating. 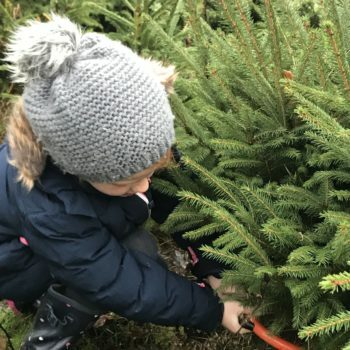 The Mini Mumblers are now even more excited for Christmas and I know this is something they will look forward to doing in future years and can see it becoming one of those family traditions. 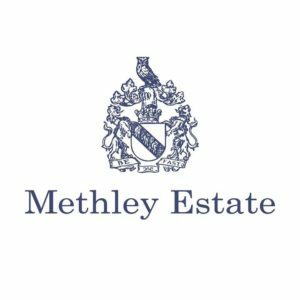 The team at Methley Estate were all extremely helpful and more than willing to help and offer advice. 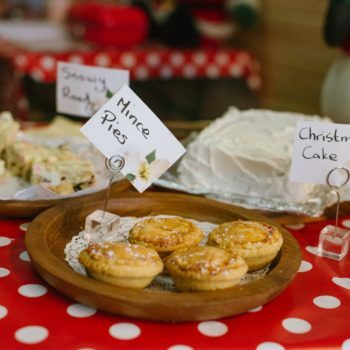 Methley Estate is open daily 9am – 5pm until approx the last week in December. 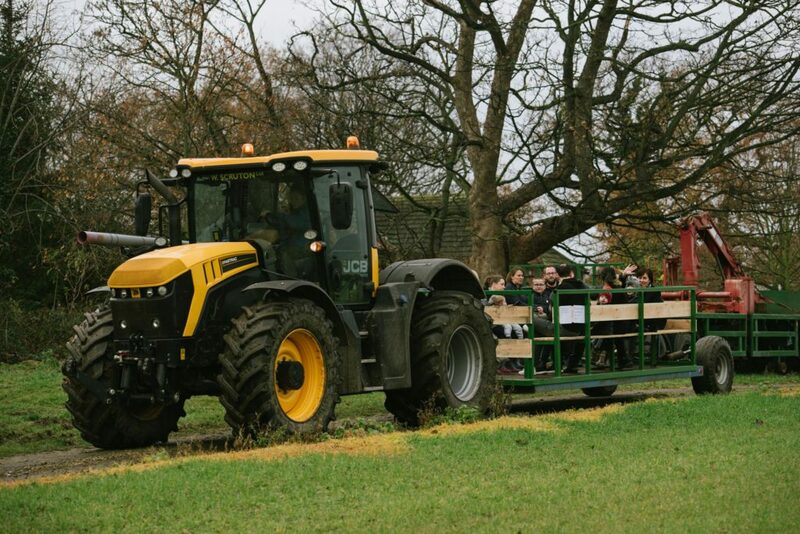 Tractor rides only operate on a weekend. 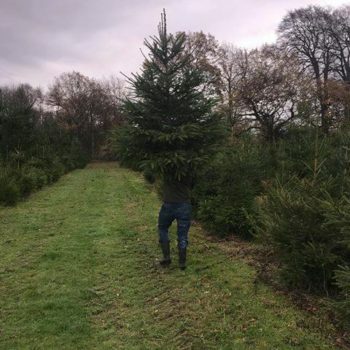 Christmas trees start from £20 (prices vary depending on type and size), cards and cash taken. *Mumbler was not paid for this review and our views are open and honest, we did however receive a complimentary tree.